What is a “360° street view” photo (or video)? It’s a unique photo or video, taken from a special camera (usually with two or more lenses facing in opposite directions) that captures and stitches together not only 360° around but also 360° up and down as well. This photo or video is typically uploaded to Google Maps (or YouTube for video) where future viewers are able to get a more immersive look around your business, venue, or event. These photos/videos are a low-cost marketing tool that typically has a substantial return on investment online because seeing they can be viewed 24 hours a day. Why does my company need a 360° street view photo or video? Our past clients have seen over a 300% increase in views to their Verified Google Business listing on these photos alone. They are just about impossible to fake and give potential customers “instant trust” as they get a chance to look around before they buy. The only thing better is a real tour around your business. Can this “360° street view” photo (or video) be used elsewhere online? Just because the image is uploaded to Google Maps doesn’t mean a qualified website designer can’t use this content on your company’s website. It can be embedded, often quite easily, on most websites. As for 360° street view videos, they can be uploaded to your company’s YouTube page and embedded on your website as well. This process can often be a little more complex. Where can I get one in Iowa? Big Ten Web Design & Online Marketing offers indoor and outdoor 4k resolution “360° street view” business photography (daylight only) in Iowa City, Cedar Rapids, North Liberty, Washington, and other areas in Iowa. We’ve decided to stick with daytime photography only because the quality is much better with this type of camera. Can you show me past examples of your work? 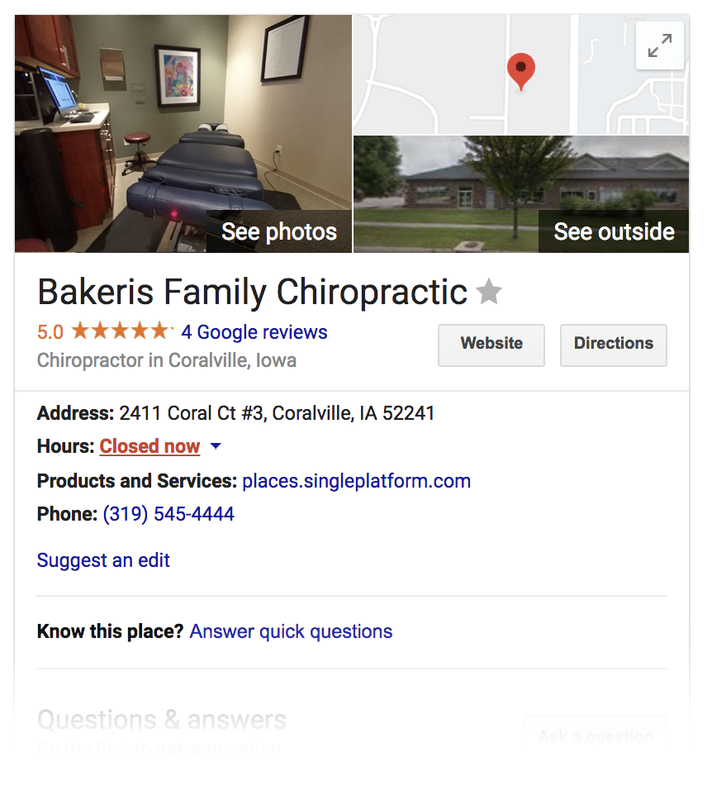 One of our clients in Coralville, Iowa that is a chiropractic company hired us to do its website as well as 360° street view photos. Below are multiple photos that we took for the company. For this client alone, we’ve seen a 670% increase in views over the past several months. Cost of 360° street view photos? The initial 360° photo (or 5-minute video) costs $130. Each photo/video during the same visit is an additional $60. Our recommendation is a minimum of 3 photos taken either inside and/or outside of your company. Most of our clients hire us to take photos in multiple rooms for a virtual walkthrough tour of their business or facility that can be seen right on Google Maps and by millions of people all over the world. It is a quick and simple way to gain extra exposure on Google Maps and to gain the attention of thousands of potential local customers. It also gives validation of your company online with Google. When do I pay for this service? Simply pay after we’ve uploaded the images to Google Maps. Big Ten Web Design retains the copyrights to these images. However, direct clients have the right to use them any way they see fit including having a 3rd party show or print them for promotional purposes. Anyone else other than our direct client cannot use them for personal/corporate gain.